The Vitamin A in Shea Butter is also important for improving a number of skins conditions, including blemishes, wrinkles, eczema, and dermatitis, and it provides excellent anti-aging properties. 100% Pure Shea Butter, produced from the nut of the Karite (ka - ree - tay) tree found only in Africa, has been used for centuries for its exceptional healing properties and unsurpassed ability to help nourish and protect the skin. The moisturizers in Shea Butter are the same moisturizers produced by the sebaceous glands in the skin. The positive biochemical and physiological effect Shea Butter has on skin injuries makes it ideal for wound healing, and many users have reported that it promotes and accelerates healing. Breast Cancer Partner is pleased to offer a special promotion to its network for this amazing 100% pure, all natural healing agent. 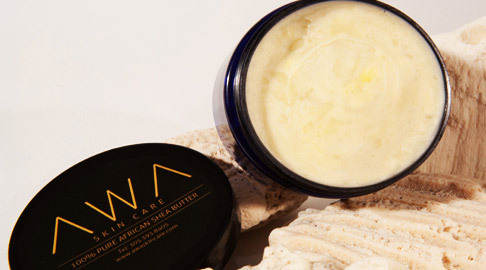 Enter the code BCP and receive $5.00 off your purchase of either the 4-oz ($14.99) or 8-oz ($24.99) size of the AWA Pure African Shea Butter. Click on the link below to place your order. To receive your special discount, click on “add coupon” in the shopping cart window and enter your code (BCP), then select “update”. Please note that the amount of time required for optimum results may vary with each condition. For example, itching and effects of some types of burns may be relieved immediately with daily use. Wrinkles, require 4 to 6 weeks of daily use. Avoid, at all cost, the use of Shea Butter until reliable clinical trials are performed attesting to safe tolerance of its use in persons with nut allergies. Please consult with your physician prior to use.